"" contains an extrinsic dash or other characters that are invalid for a date interpretation. 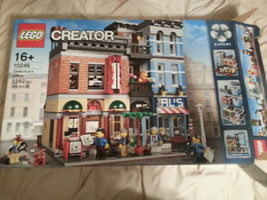 Hello there, today I will be reviewing the heavily anticipated Creator modular building release 10246 Detective's Office. This set is my first modular building (though I cannot say I have not considered purchasing from this line before) and this set will be a rather special build. This is because it will be my last LEGO set for a very long while. With college creeping up next year, I will have little money, time, or space to build LEGO despite my longing to do so. I look forward to constructing and reviewing my final set and displaying it properly for many years to come. This set was kindly supplied to Brickipedia by the LEGO Group, and is officially set to be released in January 2015. Enjoy all of my beautiful cell-phone pictures that I spent forever trying to upload. The box is big. Well, dimensionally it is longer than it is tall. To be a bit more specific (though not exactly precise), it measures approximately 57 cm x 38 cm x 12 cm (22.5in x 15in x 4.7in). 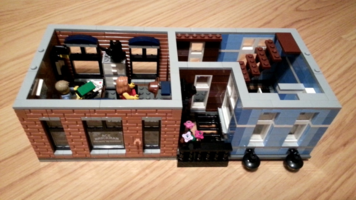 The front depicts the set with its six minifigures and the separation technique of each story of the building. Images of the rear and dimensions also appear, with the full set measuring 25 cm (10 in) across by 28 (11 in) tall. The left side of the box depicts images of each minifigure and its accessories, while the top features a lengthy list of every part and its quantity. The back depicts numerous details and capabilities of the constructed set, along with a closer look at the interiors of each level. Under these previews is the lineup of several recent modular building releases, which look incredible when connected together. If only I had the spare $900 to finish off the street. 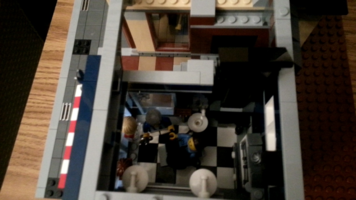 The general contents of the set are a three-story modular building, built on a 32x32 brown baseplate, and six minifigures. A notable article not included in this set is a sticker sheet; I originally began to panic searching for it, until I realized this set is sticker-free. 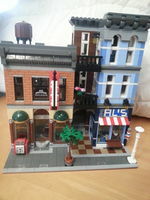 Are other modular buildings and Creator sets like this? There are plenty of printed-on logos, images and features, so the set is hardly bland. 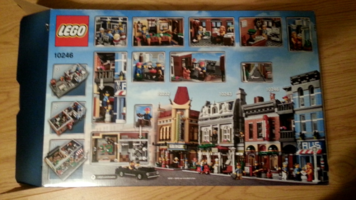 Opening this set made me realize that this would be impossible to construct in one day alone. In total, I spent four days on this, dedicating each night to a section. While there are about 17 bags in total, they are divided into four large sections. You read that right, only four sections for this model containing over 2,000 parts. My general opinion is that this could have been seriously thinned out a bit so that it was perhaps six or seven different steps. For each section, there are so many parts to separate and sort out, and while the 16+ recommendation should not be taken lightly, it was still hardly expected. The 175-page instruction book is made of a more dense and sturdier-type material with a paperback-esque feel to it. The manual feels like an actual book, but still has the classic feel of the typical large instruction booklet. There is only one set of instructions included, and the reason it is 175 pages is because it requires a large amount of smaller steps within each larger steps. I am talking an average of around 20 pieces needed per step. Page-long set advertisements split certain sections from each other, making it easy to spot when the last ends and the next begins. No pages are dedicated to show off any features of the set, however. Bags labeled "1" include parts to lay down the foundation for the modular building and the street tiles. 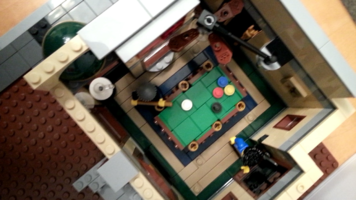 Next, the pool hall is built. 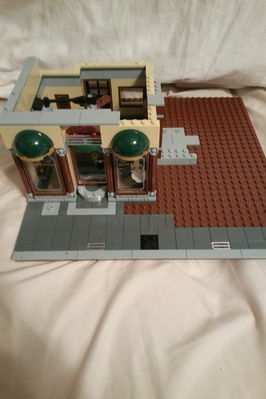 This could have easily been split into two sections, as laying down tiles and creating details such as the pool table and ceiling fan (which is rather difficult to construct unless you have a very steady hand) could have started and constructing the walls, windows, and detailing of the building could have been the next section. Bag 1 does something that every bag ends up doing, which is spreading out the same type of pieces in random bags for no reason. Just when I began to panic for missing a piece, I realized that somehow, one singular part was in a different bag full of smaller pieces while the others were located otherwise. This caused chaos often, especially when over 500 pieces laying on my floor at once was already daunting enough. Bag 2 seems less intimidating when the task is only to build the barber shop, but it is deceiving. Each night I was given an allotment of about an hour and a half to build each section, and somehow this bordered way over that amount of time. The tile layout is confusing, the mirror tilts (causing constant adjustment when constructing) and the sing saying "AL'S" could not be more difficult. The build is a challenge, which is enjoyable, but frustrating at times when the details seems much less apparent than the pool hall, "The Highlander." The inside is much harder to access due to its size, so you better hope a part does not break off. There is a barrel of candy hidden under the steps outside, however it is not accessible through the compartment space given by the shop. It could stand to be either longer or wider. While simple, it does contain a clean look and has the feel of a real barber shop. 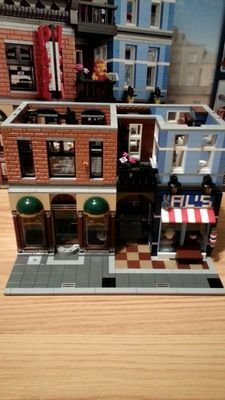 While this may have been the least enjoyable part of the build, it does show results and gives the bottom section of the modular building a beautifully detailed appearance. The bags of section 3 were probably the best part. This could have easily been split into two sections, but it felt easier after working so hard on the previous two sections. The bathroom area is lacking in much detail, save for some windows and a potted plant. 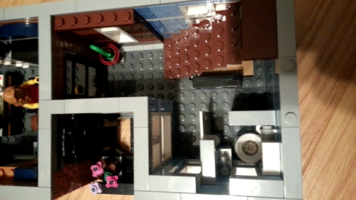 The bathroom is tight but shows plenty of attention to detail. 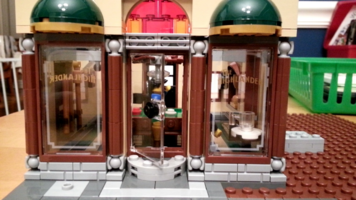 Meanwhile, the Detective's Office is extravagant in detail and design. The bricks used to build the office could not be more perfect, making the whole design feel real. 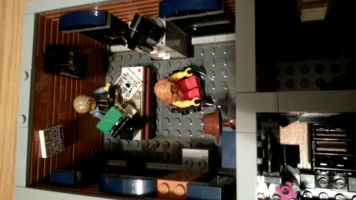 Little details such as the fan and piles of papers and maps laying on the detective's desk give this set the feel of being built by a professional. The whole design of the set does feel like it was constructed as a MOC, but this section appears particularly worked on rather well. My only complaints would be the bare floor (which makes play easier, so understandable, just not consistent with the bottom floor) and that the plant on the outside does not fit in the allotted space given and has to be placed at the edge stud on the circle. Bag 4 ended up being the easiest, mainly due to its one-room section and rooftop-based build. 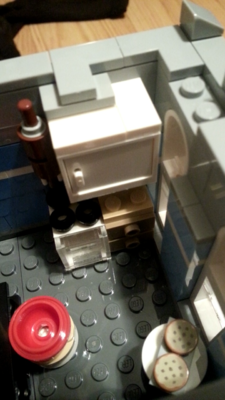 The kitchen area is incredibly detailed, though only for about four studs across. The room is just too small to pull off too many detailed parts, but it does contain some excellent designs that I will use for upcoming MOCs (such as the oven, drawers, and rolling pin that actually rolls). The rooftop looks excellent with its skyroof and water tower, though the tower is a bit short and very difficult to keep together. While the rest of the model is sturdy (unless you want to separate the stories, which is rather smooth), the water tower topples over at a simple glance. And when the interior is built from chainlinks, this is not very convenient. The architecture of the set as a whole is incredible, though flat in the front, but the roof adds a unique perspective and design by using grey TECHNIC fists and grey Unikitty tails. The build ends with constructing a bench, tree, lamp post, and aggressively unsturdy newspaper stand. Several instances feature wonderful detail and design on the final section, which was absolutely the least difficult. The bittersweet feeling of finishing up my final LEGO set was a very emotional experience, but I have to say the whole build was one of the most challenging and entertaining to date. When the instructions say "Expert Builder" on it, the warning should not be taken lightly. It may be my lack of building a large set in a while, or my crunch for time; Regardless, you will get your money's worth in this build. 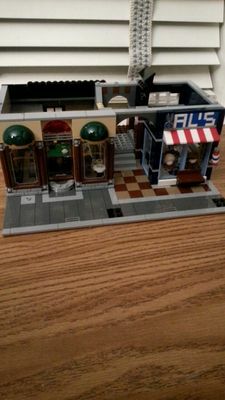 Between the ratio of less than 10 cents per piece and the intense build of each section, along with the great playability of the set, I would easily say this set is worth the price of $160.00. 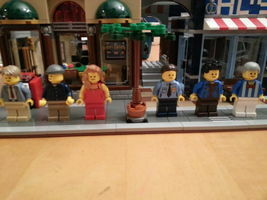 While the minifigures are spaced out so that two are constructed for each bag (excluding bag 4), they are well organized and give a bit of taste to the build with their complexity and unique designs (especially the detective). It appears they are taken out of the 1920's. Thanks for reading, I would love to hear your comments below! Brickipedia welcomes all comments. If you do not want to be anonymous, register or log in. It is free. Facts about "10246 Detective's Office/NBP3.0"
This page was last edited on 15 March 2016, at 19:19.